Known as the Volcano in its mainline days in the ’80s for its awesome eruption of steam from the chimney, Southern Railway West Country Pacific 34092 City of Wells took a further step today in its long running return to action. The first picture shows it under preparation yesterday and today the engine was brought up to pressure. 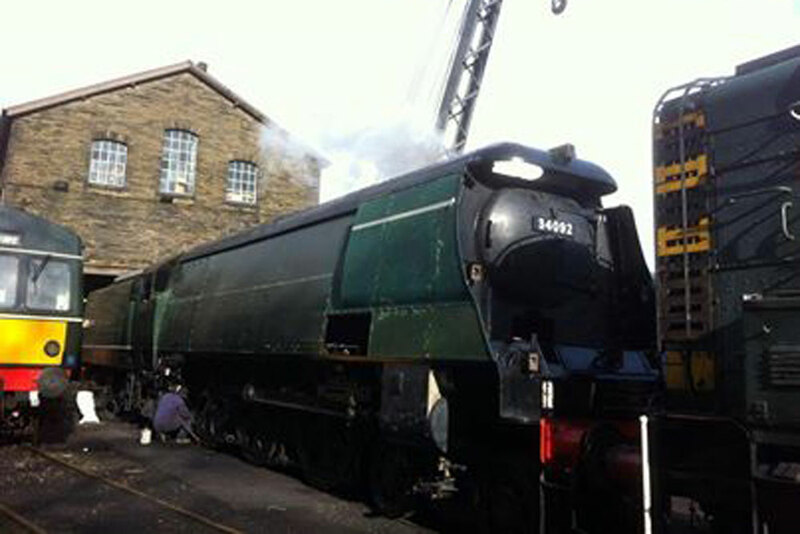 Although given a steam test 0n 3rd March 2012, the second image shows the first time for raising steam since that date for further adjustments to be made. Since ‘City of Wells’ last steamed a small band of volunteer workers, led by engineer John Adams, have steadily refurbished the locomotive. The work undertaken however has been substantial following its exploits out on the mainline when it took the national network, especially the Settle & Carlisle, by storm. There have been many jobs to complete on the locomotive. In addition to the usual overhaul of the boiler the firebox has come in for a great deal of work including a heavily restayed firebox. New dampers have been fitted on the ashpan and the original drain taps have been discarded and replaced by a modern equivalent. In addition the wheels have received new tyres. When the engine returned to steam after rescue from Barry, the streamlined casing, as re-instated on the engine, was described by one RAF pilot as being smoother than the skin of the jet aircraft he flew. Even this succumbed to the ravages of time and has had to be substantially replaced. No doubt when finished the new air-smooth casing will once again attract such comments. When exhumed from Barry scrapyard in October 1971, the engine had one of the cut down Bulleid tenders and this is how it ran following its first resurrection. The tender tank has now however been replaced by a new high capacity tank, to the same design as that carried when originally built, manufactured in the local Keighley area by engineering company Acetarc. Followers of the 1980s mainline exploits will recall that, to improve fuel efficiency and performance, a Giesel ejector was fitted in 1986. Although never carried by this locomotive, its use replicated that of class member 34064 ‘Fighter Command’. Whilst purists may not sanction such changes, its original success has meant that this feature has been retained in the rebuild. The time to completion can now be measured in weeks, not years, as only minor fettling jobs need to be completed before City of Wells moves once again under her own steam. More news and photographs will follow in the weeks to come as the engine is fine tuned and painted in all its British Railways Brunswick Green splendour. The final question, of course, is will ‘City of Well’s take to the mainline once again. Whilst is has not been overhauled to mainline standards, it has not, allegedly, been ruled out by its owners.